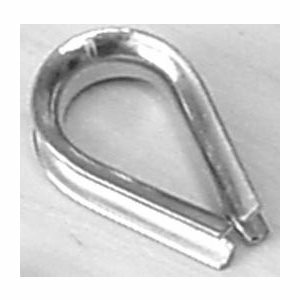 Quick link 3 / 8 x 3-1 / 2"galv. Quick link 1 / 4 x 2-1 / 4" galv. Quick link 5 / 16 x 2-15 / 16" galv. Thimble SS 5 / 16"
Thimble SS 3 / 8"
Thimble SS 1 / 2"
Thimble SS 5 / 8"
Thimble SS 3 / 4"
Thimble 8mm 5 / 16"
Thimble SS 10mm 3 / 8"